Taking a trip to a local store is not always an option for people who live out of town. This might pose a problem when one or more ingredients are needed for a specific recipe. However, you can use a variety of kitchen substitutions to get the same result as a missing ingredient. All you need to do is find out if you have substitutions that are available in your kitchen. One important detail to realize is kitchen substitutions will not always have the same texture and be the exact same as original ingredients. However, the idea is to have something that will work in a pinch for a recipe used for a meal, a snack, or a dessert. The best thing about kitchen substitutions is they may be a healthier option than one or more ingredients called for in a specific recipe. Common kitchen substitutions can be found for chocolate, cream, eggs, thickening agents, and various others based on the items you have available. You may need to mix various ingredients to get the same texture or similar flavor of the original ingredient. 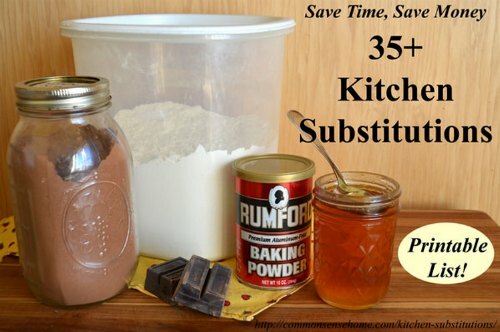 The use of kitchen substitutions is a great way for you to save time and money. You will not need to go to the store if you do not want to make a special trip. Simple substitutions also can be a good way for you to use excess food in your kitchen.